Halloween is almost here! That means lots of refined sugar, artificial flavors, and all sorts of other not-so-good-for-you ingredients will be everywhere you turn. But don’t despair! Enjoying an occasional treat can be part of a healthy eating plan, especially when it’s made from wholesome ingredients. In this Halloween Recipe Roundup we’re going to be sharing five of our favorite healthy fall sweets, so you can still enjoy the tradition of Halloween treats without compromising your health. 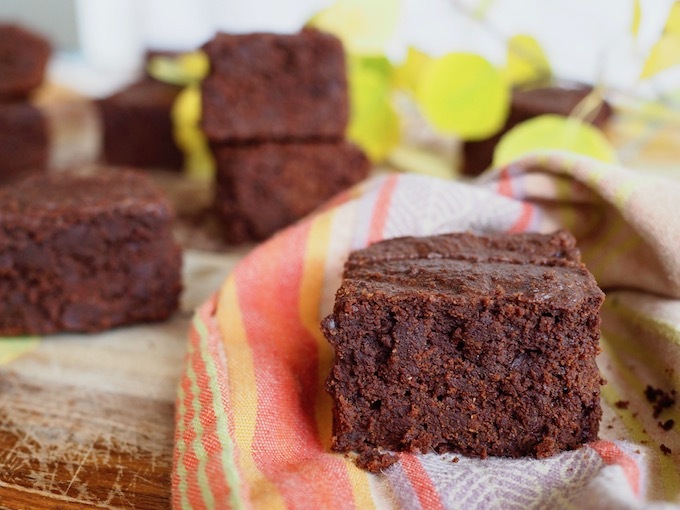 Nutritionist, food blogger, and UWC Content Editor Ailsa Cowell created these fudgy brownies—a delightful combination of pumpkin pie and rich chocolate. Tahini, pumpkin, eggs, coconut flour, and cacao powder come together to create the perfect vessel for warming spices like cinnamon, cloves, and ginger that are so comforting this time of year. These cute little Pumpkin Spiced Donut Holes are from our UWC Functionally Trained Nutritionist Deborah Phillips and they are perfect for little fingers! They are rich in fiber thanks to pumpkin, coconut flour, and psyllium husk powder, sweetened with maple syrup, and perfectly spiced. This is a great recipe to make for a crowd so everyone can enjoy a taste of something sweet without going overboard. One of our friends and colleagues, Functional Nutritionist Brigid Titgemeier, created these lovely little apple crisps. 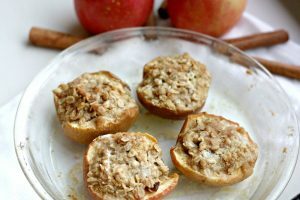 Half an apple baked with cinnamon and oats makes a delicious fall treat that is just the right serving. Make a bushel of these for your Halloween party—your house will smell amazing and guests of all ages are sure to love them. And you only need five simple ingredients. To make them dairy-free, simply swap out the ghee for coconut oil! 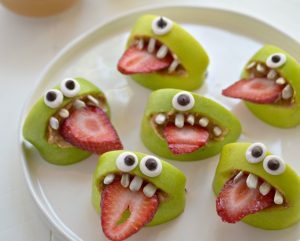 These adorable monster-inspired Silly Apple Bites are a super healthy and fun finger food that kiddos are sure to love. Created by Cara Reed from the blog Forks & Beans, these are made from just a few simple ingredients and topped off with Cara’s easy homemade googly eyes. This is a great recipe to make with your children to help spark their interest in the kitchen! These beautiful truffles are from our very own Dr. Hyman and they make an excellent less-sweet treat for dark chocolate lovers. 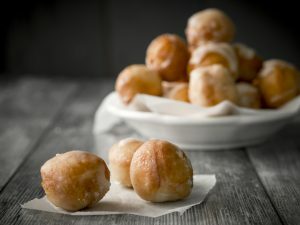 You can make them with just a touch of maple syrup or instead use stevia, for a no-added sugar dessert. 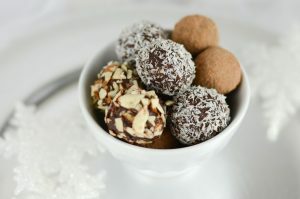 These Chocolate Truffles can be easily customized for a more seasonal flare, for example for fall you could roll them in crushed pecans, cinnamon, or finely chopped candied ginger; around the winter holidays use a bit of peppermint extract or hazelnuts. We hope you love these healthy treat options as much as we do! There are so many healthier and more delicious alternatives to traditional Halloween candy. Get inspired and make something new and exciting for your upcoming gatherings—not only will you be able to enjoy something sweet without the guilt and tummy ache, but others are sure to enjoy your healthy treat as well. Happy Halloween, from everyone at The UltraWellness Center!